Super lightweight carbon SPD-SL road pedal for high performance road racing. Lightweight carbon body provides large shoe contact area to maximise power transfer and support whilst reducing weight. The wide flat profile gives better road clearance and cornering, also allowing wider bearing placement for increased rigidity and uniform load distribution. Low profile 8.8 mm body height from axle centre to cleat contact surface. Silky smooth 3-bearing axle system, two ball- and one wide roller-bearing. Open design allows for easy access and cleat adjustments. 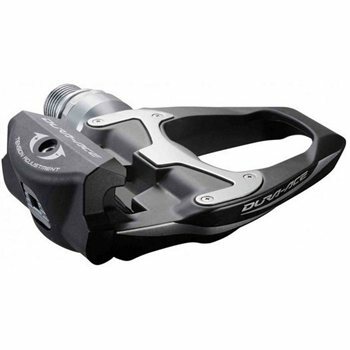 Wider shoe cleat has a long life and is easier for walking than other cleats.